A new Skeptics’ Guide is now up for your listening pleasure, and aww, look at what’s featured! Also, Richard Saunders has posted a new Skeptic Tank with audio from the Amaz!ng Adventure to Alaska! I’m in there, plus Phil Plait, Dr. Harriet Hall, and of course James Randi. Finally, don’t forget to listen to the entries for the Public Radio Talent Quest and VOTE before Sunday, 11:59PM ET! I have to shamefully admit, I haven't actually listened to anything on this challenge until now. Somehow it doesn't come across as well on TSGTTU shows over skype, but man Rebecca, you really do have one of those perfect NPR voices. Sigh. I wish I could dream of being a radio star, but my hopes of fame died when silent film went out of fashion. 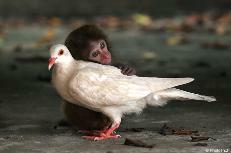 Of course, it should be obvious to anyone that the monkey is simply slowly positioning his hands so he can rip the poor bird's wings off! Think of the birds! I will be thinking good thoughts for you, becca. When do you get the call? When will you know? And just how sober are you, right now? I'd be knocking back some frozen tirimisu's, myself…..
Looks like we find out Wednesday night? I guess we'll be here madly refreshing during MythBusters.